Today, for reasons I not care mention, I found myself at IKEA. There I tried to exercise the type of efficiency that the Swiss military might dream about. Approaching the building from behind, I stealthily parked in the bunker below ground, mere feet from the entrance elevator. After surgically removing the items I needed, I made good time choosing a quick moving express lane cash register. On my leaving, I had planned (down to the penny, Sir!) to make a purchase of great import. Partridgeberry Jam - mistakenly named Lingonberry Jam by the Swedish dolts who purvey the fine stuff. You see, IKEA is the only place I know of, in Toronto, as a reliable place to get something approximating Partridgeberry Jam. ALAS - I was thwarted! 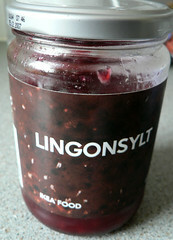 They no longer stock Lingonberry Jam, and I would have to settle for Lingonberry Sauce. Lingonsylt? Sounds like something found at the bottom of a murky lake. Ohhh yee Swedes! Thieves of Hockey Gold (do you think I forget Lillehammer, Forsberg?!) and now thieves of beloved preserves. So there it is... my thin red connection to Newfoundland, made possible by a Swedish furniture chain has just gotten thinner, and notably runnier. When will this madness end? Thankfully - Winter is OVER in Toronto - at least today. We've really only been in the deep freeze for 6-8 weeks and already the locals had become restless. It's a balmy, gorgeously sunny day in the Big Smoke and I took the opportunity to go for a wee splash about in the local pool. Refreshed - I see every problem has a solution, every challenge, an opportunity and yes, even Lingonbery Sauce might well do as Partridgeberry Jam! Rather than write a long-winded explanation/treatise of my latest medical updates and what not, I thought I'd record a long-winded explanation of my latest medical updates. For good measure, you can hear me complain about the winter weather - in song! oh you shoulda seen the jazz hands (Jazz Hands™ sold separately). Remember, if you have any questions don't hesitate to call or if you have any suggestions or complaints, send a lengthy tirade to pm@pm.gc.ca. The shirt Mike sent fit like a glove (except like, over my head and arms and not like, over my fingers). I will point out that the when printing white on dark, the design should probably have been inverted... ok, ok, I realize this is useless to point out but I needed to say it. I'm sure when I wear it, Torontonians will covet it immediately because of their insatiable need to have something unique that others do not have. Just when I thought I was experiencing "the coldest day of the year", we keep having another "coldest day of the year". It's a shame that freaky weather of January didn't continue. Not only were golf days in January making capital "C" Conservatives look like capital "F" idiots and "climate change deniers", but we were actually enjoying golf days in January. It was like a two for one sale. Now you may just be saying that like anyone else living in Toronto, I've become a bit of a wuss when it comes to cool, arctic air masses, and I agree. In fact, I dare anyone to live in Toronto for a few years of relatively mild winters and not become a bit of a wuss. My heart certainly goes out to any new-ish Canadians who have moved here from a warmer clime. Yet, what to do except don your favourite thermal underpants, and an extra pair of socks? It is Canada after all. This cold snap is having another, more sinister effect. Cabin fever - or as I prefer to say, "Lodge Ennui". Why go out and do something when going out and doing something is actually incredibly uncomfortable? I could see where if you were someone who tended to enjoying listening to music (check), watching movies (check), reading magazines (check), worked almost entirely on the computer (check) and used the Internet to work with others (check) that you might find yourself staying inside quite a bit and on occasion, having thought provoking conversation with the cat (check and check). I've generally been avoiding leaving the house and I think it's making life really boring. It's strange really. It's not that I don't have things to do, it's just that, as I'm doing things, I find them incredibly dull. I have no idea why. It got me wondering what Boredom actually was. What's the structure of it? It's not that the things I'm doing aren't challenging or even too challenging, it's just, I've lost interest in them. I wonder if it's not like being at a party where there are dozens of interesting people talking but you really can't hear any single one conversation clearly and you just tune out. It's not as though there's a thought bubble above my head with the image of a wind up toy monkey banging a cymbal, it's more like there's a thought bubble above my head with the image of a wind up toy monkey just sitting there... waiting to be wound up. Perhaps this is really just February's fault. I don't care for this Aquarian/Piscean month which is a bit of a cultural nobody. There's a weird thing where some of our neighbours still have Christmas lights up, St. Casimir's on Roncesvalles still has the nativity scene in place, while all the shop windows are full of cheap and gaudy Valentine's merchandise. I can't decide whether to hurl a brick or just hurl. Well, I've got some work coming up soon, and I'll be busier, and when I'm busier, I do more, and when I do more, life gets its juice back. Unfortunately, one other side effect of being bored is developing a highly refined ability to procrastinate so I think my work ethic may have slipped into the "couch zone" - only a very strong vacuum will be able to dislodge it from between the cushions. One bright spot to my procrastination. I've discovered how to pirate movies. Ask me how I became a pirate!